Over 19-21 January the 17th Asia Superyacht Rendezvous Cup (ASR Cup) welcomed majestic superyachts to host venue Sala Phuket Resort & Spa for a unique event where yacht owners, captains, crews, guests and invited VIPs enjoyed the fabulous hospitality of the venue featuring special social and racing events. The ASR Cup guests enjoyed a fantastic Opening Day Cocktail Party afloat where guests were treated to delicious tapas and incredible cocktails mixed by The Savoy’s very own famed bartender, Celine, on the spectacular S/Y La Numero Uno, Perini Navi’s first-ever constructed yacht. Saturday offered just the sort of weather conditions needed to get the fleet going. It was a beautiful day out on Mai Khao Bay on Race Day 1, beginning with nice northeast winds. However, due to a few maintenance issues on the yachts, race time was pushed back to 12:15 pm with wind wrapping around toward the west. S/Y Intrigue kicked things off by crossing the start line 2 seconds early, causing them to have to restart – incidentally at the opposite end of S/Y Aphrodite and S/Y La Numero Uno, giving them a big advantage with wind direction. By the first mark, S/Y Intrigue was half a leg in front of the others, by the second mark more than a leg ahead and by the third mark had lapped S/Y La Numero Uno for the win. 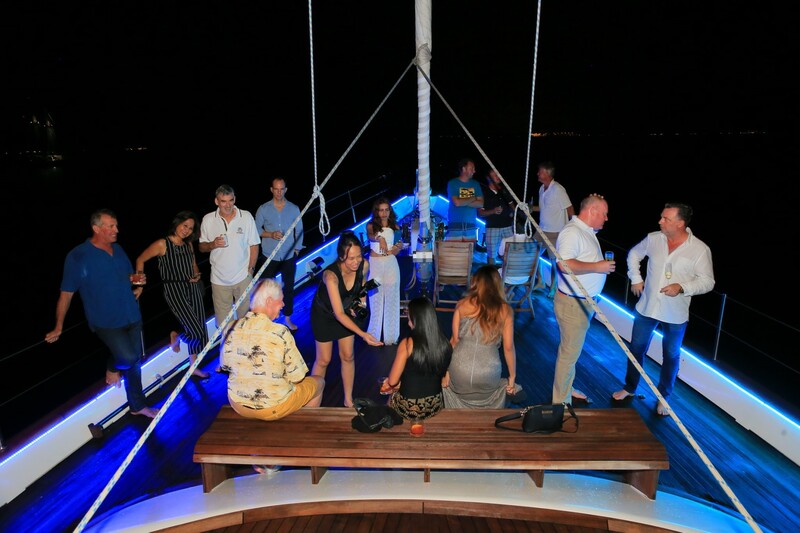 Following the races and as the weather cleared, guests and crew gathered on the lawns of the beautiful Sala Phuket Resort for the popular model boat evening race, “The Challenge”. While guests were treated to a truly special buffet the crews of the participating yachts and sponsors were hard at work, each with a secret “bag of bits” (some of balsa, polystyrene, sticky tape and string) to create and build a model sailing boat. This year saw 10 teams battle it out, ASR Cup Model Boat-Building & Racing Team Names included: Aphrodite; Sunrays 1; La Numero Uno; Intrigue; Darling; Aveline; Stereden; Seraf; Siam Princess; and Sunrays 2. The “Best Design” award went to M/Y Darling. But alas, there can only be one champion and after a cheerful evening of laughter, enthusiastic applauding and a few sunken model yachts, it came down to S/Y Aphrodite and S/Y Seraph. After inspection of the yachts, the intense battle began, ending with S/Y Aphrodite coming in first! Congratulations to the winners and well done to all crew who participated, making this year’s “The Challenge” one for the books! Race Day 2 of the Asia Superyacht Rendezvous ASR Cup aims to be just as exciting as Day 1 racing and will see the implementation of a handicap and a final reporting of race results and the “Gala Dinner” Awards Ceremony to be held on the lush grounds of the Sala Phuket Resort.